At Bone’s, Atlanta’s most venerable steakhouse, a clubby place of oak paneling and white tablecloths, the gold-jacketed waiters now greet diners by handing them an iPad. It is loaded with the restaurant’s extensive wine list, holding detailed descriptions and ratings of 1,350 labels. Once patrons make sense of the touch-pad links, which does not take long, they can search for wines by name, region, varietal and price, instantly educating themselves on vintner and vintage. Since their debut six weeks ago, the gadgets have enthralled the (mostly male) customers at Bone’s. And to the astonishment of the restaurant’s owners, wine purchases shot up overnight — they were nearly 11 percent higher per diner in the first two weeks compared with the previous three weeks, with no obvious alternative explanation. Other restaurateurs who are experimenting with iPad wine lists, from Sydney to London to Central Park South, report similar results. Restaurateurs find not only are patrons buying more wine, but they are buying more expensive wines. 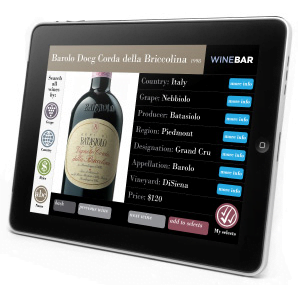 Part of this is because of the additional information available on the iPad wine list, including wine ratings by Robert Parker. Incentient, a Long Island company that makes wine-list software for the iPad, has received orders from 40 restaurants, up from 5 a few months ago, said Jennifer Martucci, the vice president for product development, sales and marketing. Celebrity restaurateurs like Gordon Ramsay and Todd English are among the pioneers. 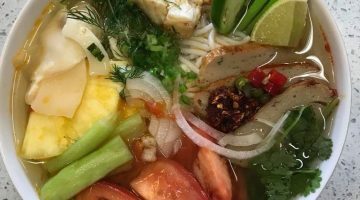 Some restaurants, including Bone’s and Naples Tomato in Naples, Fla., have developed their own software. Previous Post: « The Winners of Our 2010 Food Writing Contest! They had something very much like this at Aureole in Las Vegas years ago, and it was definitely the best way I’ve ever seen to order wine. You had the ability to select regions, price ranges, varietals, and various combinations. The iPad is a perfect way to take something like this more mainstream, and I’d love to see it anywhere there’s a good and fairly sizable wine list. If given the choice, would you rather see wine listed by region or variety?? And once that is decided…by price or alphabetized? The beauty of this is that you don’t have to make that decision in advance. You can start with a region, color, varietal, price, or any other variable. Then, you can start limiting the choices by electing one or more other selection criteria. For example, first ask for all reds, then limit to French wines, then Bordeaux, and further limit to wines under $100 (good luck with that :-)). Or start with your price range, then look at all alternatives within that range. You can pretty well search any way you see fit starting with what’s most important. It’s awesome. Haven’t seen the iPad app yet, but I’m assuming it has that sort of flexibility. Way to go, for smaller Restaurants, too! Cool idea. I was talking to a wine director about this very thing a few weeks ago. While the device did lead to an increase in wine sales, he had mixed feelings. He liked the revenue, but felt people were buying less interesting, more “Parkerized” wines. His list was designed to sell Austrian whites, but since the introduction of the ipad, they sell more Napa wines. There is something to be said for talking to a restaurant’s staff to get a wine that is appropriate for the restaurant’s cuisine. Are you suggesting that one cannot pair the listed wine in the iphone? or it still requires a staff member to communicate which would be the ideal pairing? Isn’t that as much about the design of the list? If the restaurant wants to sell more Austrian wine then the list has to offer many more of those than from California, or anywhere else for that matter. I ate at Montrachet in NYC ten years ago, and seem to remember ONLY Montrachet wines on their list. They actually had a huge list with representations from all around the world, but the emphasis was at the beginning and most people never got past it. I can’t wait to be handed an iPad with a wine list on it – and the menu for that matter, with the wine pairings offered, all researchable. Then the conversation with the staff is so much richer.